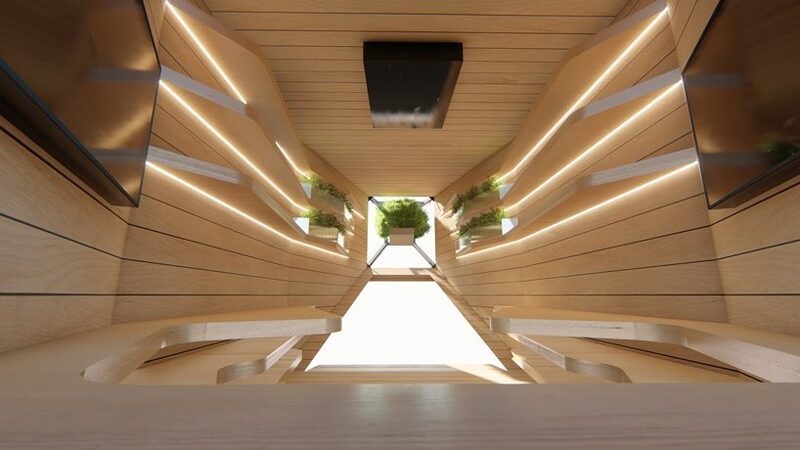 rubner haus and IED istituto europeo di design of turin present ‘rubner haus spaceship’, a wooden living unit standing on metal feet with a door-ramp access that allows visitors to live a few moments immersed in the near eco-friendly future. 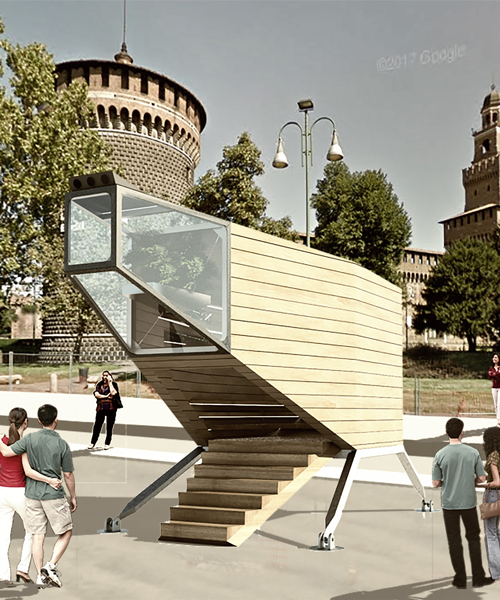 the project will be on show during the milan design week from 17 to 22 april in piazza castello, downtown milan. 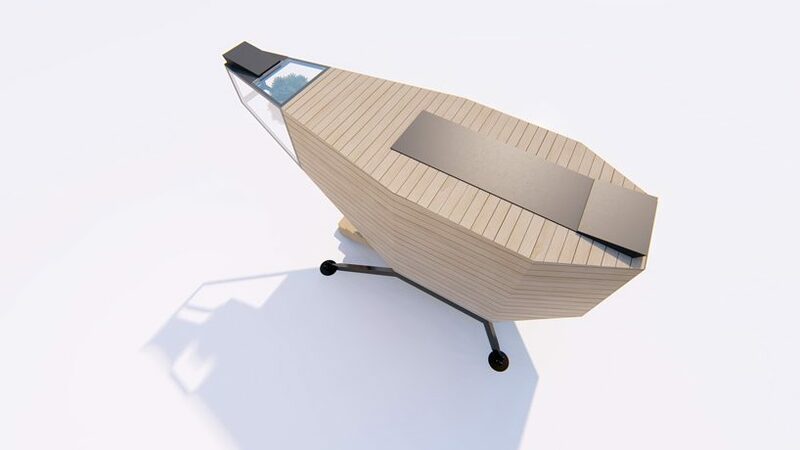 the project is born from the idea of ​​creating a ‘self-sufficient organism’ capable of exploiting the sun and photosynthesis to produce energy, food, oxygen, and water necessary for the vital support of those living in it. it is mix of smart and sustainable design with the innovative solutions to be applied to one of the oldest methods of wood construction, the blockhaus system. 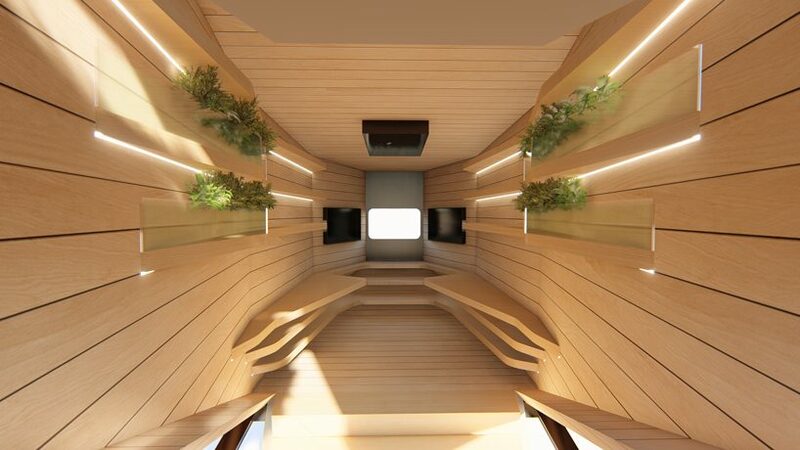 rubner haus spaceship has been conceived as an intelligent container of vital processes and is configured as a passive module, which can be implemented with bio-responsive technologies that allow it to react actively to the environmental stimuli of the host context. 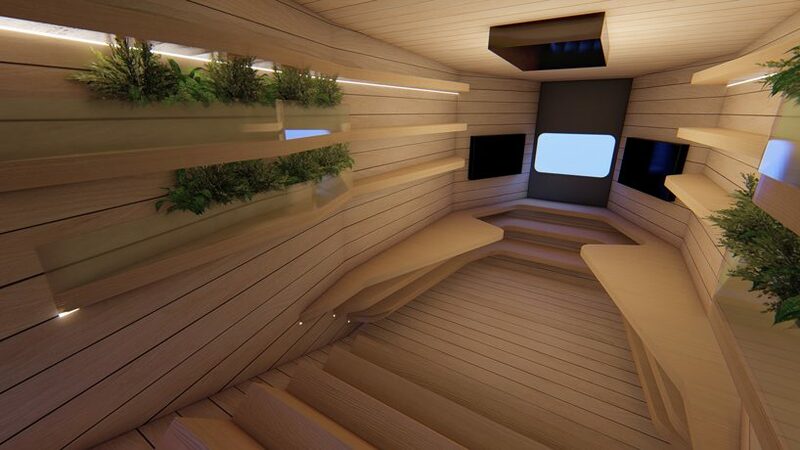 the side walls are internally lined by a vertical vegetable garden, a source of vegetable proteins with a high nutritional value. this type of food is also recommended by the world health organization, as of a balanced diet essential for a healthy life and able to significantly reduce the incidence of cardiovascular diseases and tumors, and able to considerably slow down the aging of cells. the plants and algae present in such a restricted environment are also fundamental elements for the regeneration of the air through the absorption of the carbon dioxide produced by breathing, and the production of oxygen. 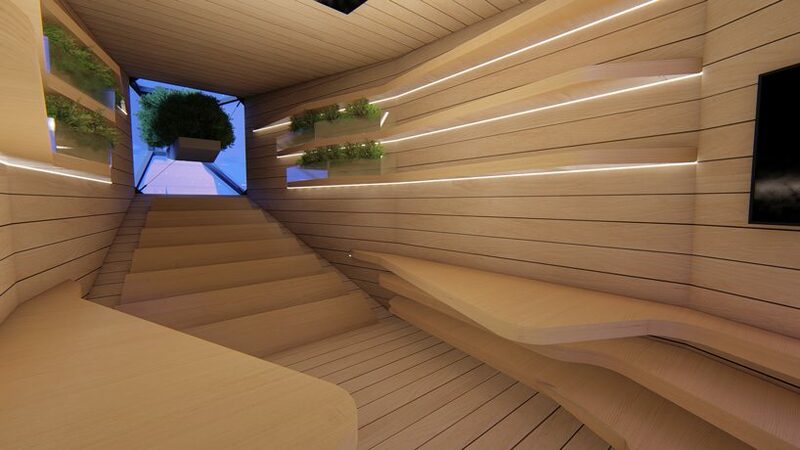 the solar greenhouse on the tail of the ship also allows a natural purification system. the water necessary for these processes is collected from the rain and stored in a tank located under the nacelle, which is then channeled into an irrigation system automated by small, low-consumption pumps. light, another fundamental component of photosynthetic processes, is the natural one of the sun, integrated by LED spot systems in the less illuminated areas and in the nocturnal setup. rubner haus spaceship uses only electricity produced by the sun thanks to a system of high performance photovoltaic panels integrated in the roof and is collected by a tesla powerwall domestic battery. the goal is to achieve 100% self-supply produced entirely from renewable solar energy: during the day, the panels produce the energy necessary for the functioning of the active systems, and the excess energy is stored in the battery to be used at night or in bad weather.